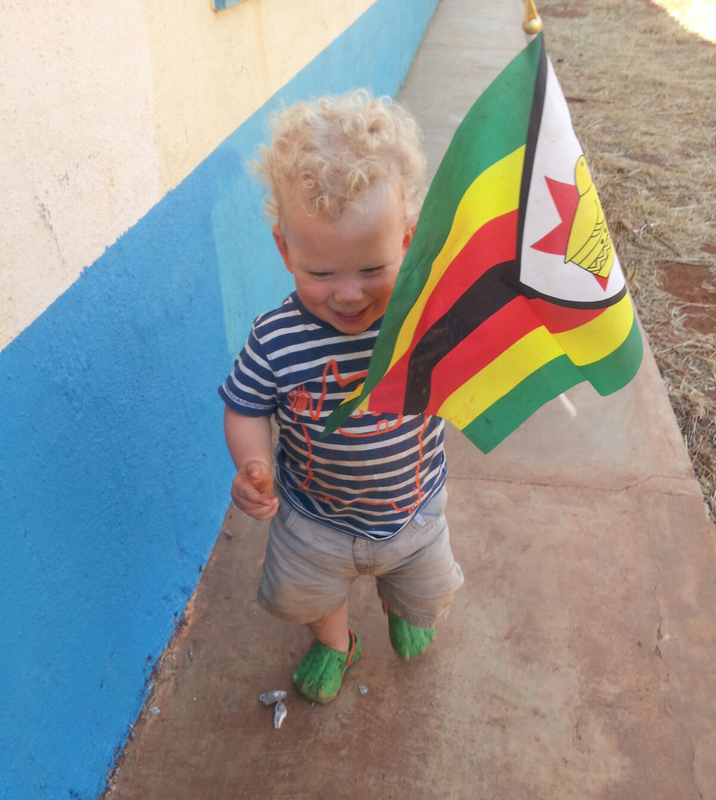 One of my three little sisters has been living in Zimbabwe since 2011 and comes back to visit us in England around once a year. THAT ONCE A YEAR IS THE DAY AFTER TOMORROW. I’m SO excited that I quite literally do not know what to do with my arms. Luckily for me I’ve only reached Mr G levels of anticipation, I haven’t quite scaled up yet to Kardashian kraziness. 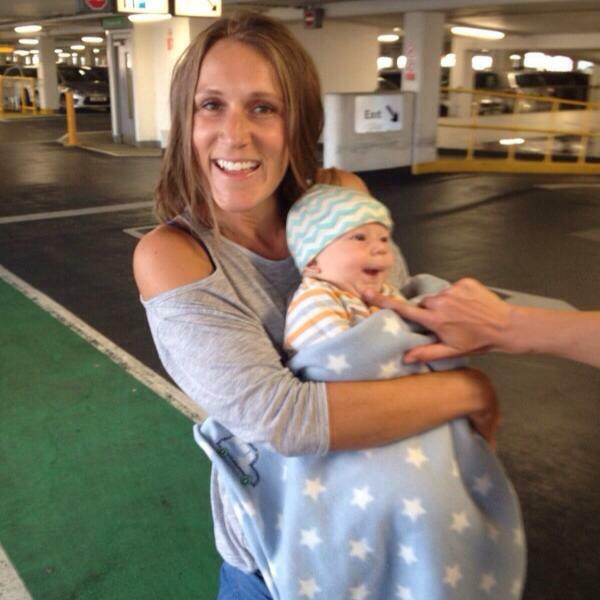 To make the rest of us UK-residing sisters even more delirious, our little nephew will be in tow. And he’s recently been voted The Cutest Button in Toytown (by me). Whenever my sister Martha and her husband Ezra do fly back, our family all go to meet them at the arrivals gate in Heathrow. And we squeal at EVERYONE who comes out – thinking it might just be them – even though we can quite clearly see it’s an old Chinese man. Or team of 7ft basketballers. Or a cleaning truck. Everyone gets a squeal as they emerge around the corner just in case. The first time that she returned in 2012 we were obviously especially giddy. I toyed with the idea of going in fancy dress to meet her at Heathrow, but toying can turn to doing when you say it out loud over lunch with friends at work. 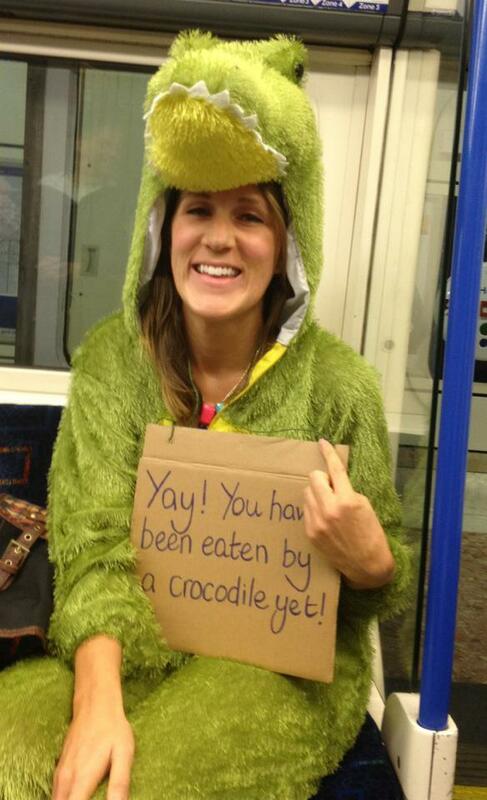 “I have a full length crocodile costume! You can wear that!” said my friend Nage, helpfully. To be fair it was too perfect to pass up. I’m actually pretty bloody terrified of the creatures, but the family joke is how mad she is to live somewhere where they are a local animal, so a crocodile costume it was. Plus it’s fancy dress. Come on. Literally any excuse. So I decided I’d meet her in style: crocodile style. Martha and Ezra were landing at about 6am and I was travelling alone to meet the rest of our clan there, and needed to catch the first tube of the day. I was already in costume: if I was going to turn up at one of the world’s busiest airports in full fancy dress garb, I might as well start my journey as I meant to go on. The Piccadilly line to Heathrow was slow that morning. Well, it was going at its normal train-type speed I imagine, but I cannot tell you how slow a train feels when your long-lost sister is due to land any minute, you’re still 11 stops away…and you’re the only crocodile in a crowd of homosapiens. LUCKILY I’m not new to embarrassing myself on the tube. So I smiled (no one smiled back, they know the song) and gritted my croc teeth all the way along the line, willing the train to go faster. I was in SUCH a rush to get to the gate in time for the all-important “This one’s not an old Chinese man, this one’s actually HER!” squeal, that as I dashed along the moving pavements of the airport, and finally found my family, I’d completely forgotten what I was wearing. Of course they all erupted into laughter which brought me crashing back to earth (or swamp). “Only YOU!” they pointed and laughed. OH YEAH. I forgot I was wearing that. And I was just in time. Martha and Ezra emerged out of the arrivals door just seconds later. While the rest of the family drove them home, my dad and I travelled into work on the Piccadilly line together. It was still early, about 8am, and we boarded the train in complete silence, exhausted from the early start and emotional reunion. Once seated, I found myself drifting off on my dad’s shoulder. He was suited, booted and carrying his briefcase. We hadn’t said a word to each other. When I opened my eyes folk were looking at my dad like “Do you even know this reptile?”. I’d borrowed the costume from my frolleague Nage on one proviso: I had to keep it on and arrive for our all-staff daily morning meeting wearing it. CHALLENGE ACCEPTED. I don’t have a photo of that particular part of my morning but – take my word for it – I sauntered into the meeting of 40 or so people wearing my full fuzzy green head-to-toe outfit and kept a straight face for as long as humanly possible. I’d wager it was no more than 0.3 seconds. Hilarious, as always! Have fun!